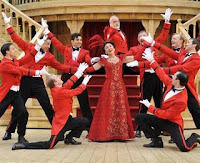 There Ought To Be Clowns: Review: Hello, Dolly! 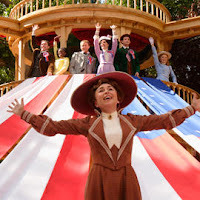 Ending this year's run of shows at the Open Air Theatre in Regent's Park is a revival of the Jerry Herman musical Hello, Dolly! It is a classic piece, and its presentation here is respectful of that and delivers a straight up rendition mercifully free of irony. Hello, Dolly! is not for people who claim that they don't like musicals. It is old-school Broadway singing and dancing through and through and about as much fun on a stage as you could imagine: there is no place for cynicism here. 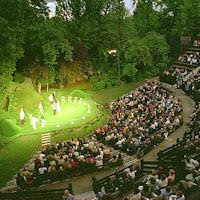 Admittedly, I did not see it in the heights of summer when one might expect a slightly better chance of sunshine, but one did start to question the methods of the Open Air Theatre on rainy days, as the stagehands were made to work extremely hard, wiping down the stage diligently four times in 45 minutes before the actual start of the show. One began to feel so sorry for them as it seemed every time they finished a new shower would begin. Fortunately, the sheer joy of the production meant that the conditions were soon forgotten. The plot concerns Dolly Levi, a widowed matchmaker from New York, who is well kn own for her well-intentioned interventions, who has set her eye on Horace Vandergelder and in order to prove her love for him, has to neogotiate the lovelives of at least three other couples around them. 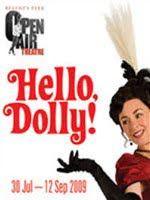 Samantha Spiro is just superb as the titular Dolly. Her singing and dancing may not necessarily be of the highest order, but her performance transcends this as she carries the whole show on a wave of warmth and ebullience. Her meddling only ever seems to come from a place of love, and this is shown by the genuine affection shown to her by the entire cast. Vandergelder was played by an understudy on the night I saw it, and he could probably have done a little more to show us some of the underlying kindness beneath the gruffness, to show us what it is that attracts Dolly so. Of the supporting roles, Josefina Gabrielle as t he flirty milliner Irene Molloy, and Daniel Crossley as Cornelius Hackl, Vandergelder's hard-done-by employee were both excellent, investing their sub-plot with much humour and pathos (Crossley's dancing in particular was a sight to behold), so much so that I cared as much about this relationship as I did about Dolly's, which is most probably want Dolly would want us to feel anyway. Staging-wise it looks good, the wooden set showing some flexibility as each of the key locations and with some imaginative use of flags and material to add some real vibrancy to some numbers, but it was the choreography that really set this production above the rest in terms of sheer quality. The two set pieces for 'Waiters' Gallop' and 'Put On Your Sunday Clothes' have to rank as amongst my favourite things seen on stage this year and were worth the entrance fee alone. The group numbers are performed with infectious happiness that I constantly found myself just beaming at the spectacle. This production really does deserve a West End transfer, and I thoroughly expect Spiro to receive at least some nominations, if not awards, at the end of the year. Finally, another reason why I loved it so much. Hello, Dolly! is the only film that the adorable robot Wall-E is able to watch and it informs his whole perspective on love: walking out of this performance, I thought what a wonderful MGM world that would be to live in.